Healthy, flavorful, beautiful Thai recipes! 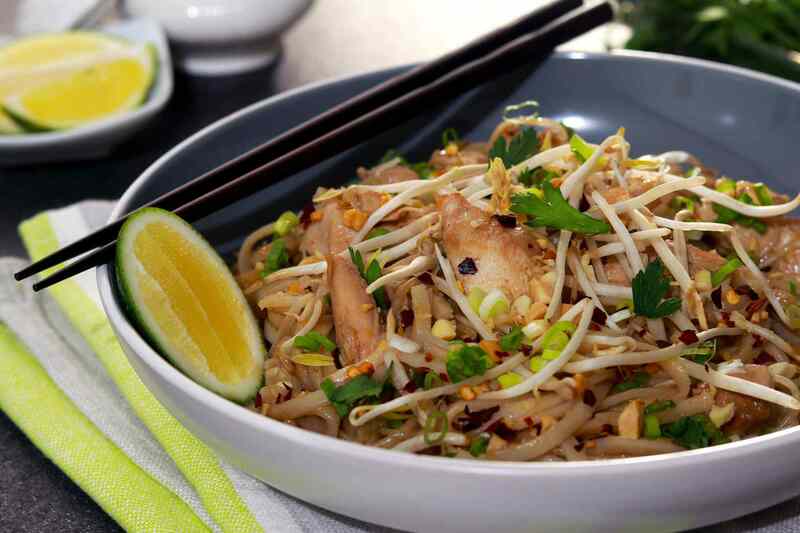 Thai recipes add huge flavor and loads of healthy vegetables and herbs to gluten-free diets. Here are my favorite gluten-free Thai recipes from Darlene Schmidt, our talented Thai Food expert. Carefully read labels when buying Asian sauces. Several brands including A Taste of Thai, Eden Foods, and San-J make the gluten-free fish sauce and wheat-free Tamari soy sauce. They also make sauces with gluten so reading labels is very important! Look for sticky rice flour, also called sushi or sweet rice flour at Asian markets where it is often less expensive than when purchased at health food stores or online. Look for gluten-free rice noodles at Asian groceries or try the Thai Kitchen brand gluten-free Pad Thai noodles, available at most large groceries. Also, check out Darlene's visual step-by-step guide to preparing Pad Thai. A basic step in preparing great Pad Thai is not to overcook the rice noodles! If you love Wasabi Peas, you'll love this healthy, homemade snack and appetizer recipe for Spicy Roasted Peas. Darlene uses frozen peas in this easy recipe. Lettuce wraps are so much fun to eat! This delicious recipe for Mini Shrimp Lettuce Wraps makes a wonderful appetizer or light lunch fare. Be sure you use gluten-free fish sauce. If you can't find it, substitute gluten-free soy sauce. Here's a Thai recipe made for gluten-free diets! Coconut milk and shredded coconut add just the right amount of mild sweetness to this lovely Thai side dish. Try this luscious recipe as an out-of-the-ordinary breakfast cereal too. I did and I love it! This recipe for authentic Thai Chicken Satay starts with economical chicken thighs and a fabulous homemade marinade paste. Be sure to use the gluten-free fish sauce and soy sauce in this recipe or substitute 1/4 to 1/2 teaspoon of salt instead. Here's a healthy Thai coconut shrimp recipe for special occasions that doesn't involve frying- this terrific recipe is baked! This lovely Thai dipping sauce is so fresh and delicious you will find yourself dipping all kinds of foods in it. Darlene suggests serving mango dipping sauce with coconut shrimp and cooked shrimp. It's a terrific alternative to the cocktail sauce! If you love coconut you'll love Coconut Pudding Cake. Coconut milk, coconut extract and toasted shredded coconut add triple coconut flavor to this fabulous Thai dessert. Rice flour and eggs are used to thicken this easy recipe. This classic, beautifully layered and colorful Thai dessert is both gluten and lactose-free. It is made with sweet rice flour, sometimes called sticky rice or sushi rice flour, tapioca starch, and coconut milk. Look for rice flour in Asian markets, where you can often save money on this versatile gluten-free flour. Darlene says of this recipe, "Don't be deceived by its simplicity - the taste is so wonderfully sweet and exotic that I find it addictive! It's also a low-fat dessert that happens to be incredibly healthy." Along with bananas, you will need "lychee," a beautiful Chinese fruit with a sweet pulp and high in vitamin C. It is usually available canned but if you can find fresh lychee, all the better!